On the approach, the Rocket R9 is sleek and modern in appearance. It's eye-catching in much the same way that a foreign car is eye-catching. There's something familiar about it, for those baristas who are used to Nuova Simonelli Aurelias and La Marzocco Lineas, from the straight lines, chrome finish, and lever-style steam wand valves. The construction is clean and straight-forward, and the R9 boasts a moderate height from group head to drip tray, allowing for a 12oz paper cup to be placed under the portafilters without the shot having to fall too far. Individual PIDs for each group head and pressure sensors allows one to pull consistent consecutive shots during high volume times with reduced recovery times. Temperature and shot timers display on a clear, digital readout. The steam wands are cool-touch at the joint and have considerable pressure when fully engaged, meaning that milk frothing will never lag behind the pulling of a shot. For baristas who are good at timing their drink queue, every second in sync counts, and the levers, though they require some playing with and getting used to, give quite a lot of control over how quickly one wants to bring their milk to temperature. Everything about the Rocket R9's operation has been streamlined, as Italian design is so good at doing, without being dumbed-down. La Marzocco has long been industry standard for workhorse machines, and the R9 keeps pace with some of the sturdiest models I have used at high volume stores in the past. To keep with the car analogy, I'm at the level of comfort in using this commercial Rocket that I am with using my Audi (a 2016 A3). What I require from both machines is reliability and handling. Getting used to the automatic features does have a learning curve, but therein lies the beauty of making the machine yours. I can set when and how my automatic functions kick in, or I can take control back entirely and ride in a manual mode. In regards to getting me from point A to point B, both machines do so quite handily and with plenty of power, but they get me there in style, and with features designed to assist me in efficiency. Perhaps the best thing, in my opinion, about the Rocket is how easily it can be put into stand-by mode. When cleaning the machine, each group head can be turned off and back on with a single touch, allowing for ease of break down at the end of the day. Holding the program (P) buttons for 20 seconds turns the machine to stand-by mode without having to turn off the power switch, saving energy and making start up the next morning extremely quick (about 10-15 minutes, at the push of a button). The drawbacks of the R9 are few, and mostly cosmetic. The first is that the control panel of the machine can get quite hot to the touch. Resting one's hands there is ill advised. The second issue, which may not be an issue for some, is that chrome is notoriously magnetic to fingerprints, dust, lint, and coffee residue. To keep the machine looking its best, Rocket graciously provided a polishing cloth, and believe me, you will use it a lot. The last issue is that the R9 steam wands are not quite as free in their range of motion as a La Marzocco, though this is more a matter of getting used to the particular angles of the machine. In observing several baristas play around with the R9, all have said the steam wands were the most challenging aspect of the machine. 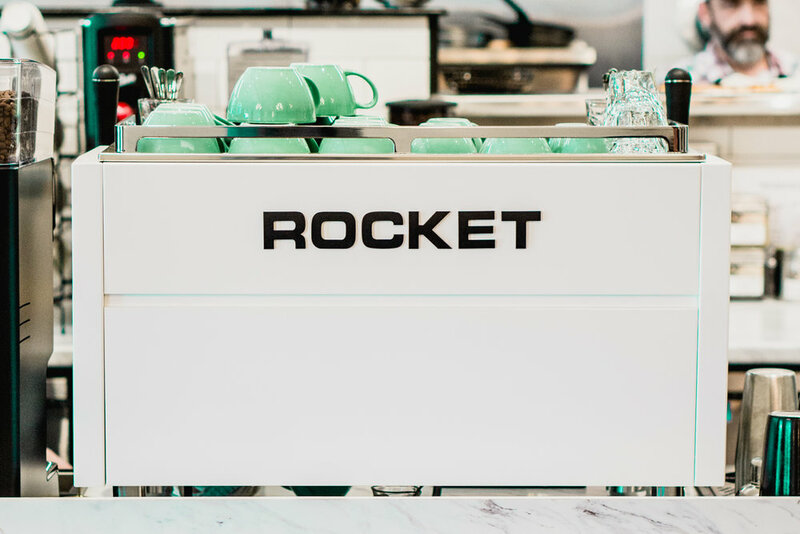 All in all, the Rocket R9 is a great addition to the cafe and one that I have grown to love using on a daily basis. Its automatic features make it accessible, reliable, and consistent for baristas of all levels of experience, while preserving manual functions for more skilled baristas to custom tailor their product, if they so choose. My experience with the R9 makes me quite excited to see Rocket release more commercial machines and see what else they'll be able to do in the future. Grazie mille per l'opportunità!